We're on the corner of Business Route 29 and Laurel Street. 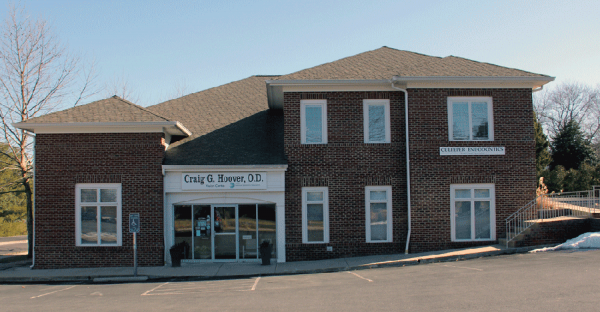 Our office is located on the corner of Business Route 29 and Laurel Street on the south side of Culpeper within 1 block of the Culpeper Regional Hospital. Although our office faces Business Route 29, the entrance road to the office is on Laurel Street. Take Route 29 South to Culpeper. Continue on 29 South to the second Business 29 exit at the southern end of town. At the end of the exit ramp, turn right onto Business 29 North and follow for ½ mile. As you crest a small hill you will see our office on the right at the corner. Turn right onto Laurel Street. (If you get to the stoplight at Sunset Lane, you have gone too far.) Proceed 50 yards on Laurel Street and take the first right followed by another immediate right into the parking lot. Follow the road to the front of the building for parking. Take Route 29 North to the first Culpeper Exit for Business Route 29. Take the Business Route 29 exit and follow for approximately ½ mile. As you crest a small hill you will see our office on the right at the corner of Business 29 and Laurel Street. Turn right onto Laurel Street. (If you get to the stoplight at Sunset Lane, you have gone too far.) Proceed 50 yards on Laurel Street and take the first right followed by another immediate right into the parking lot. Follow the road to the front of the building for parking. Take Route 522 East to Culpeper. After passing Yowell Meadow Park on the right, turn right onto Blue Ridge Avenue. Follow Blue Ridge Ave. to the stoplight at the intersection of Business Route 29. Turn right and follow Business Route 29 straight through two stoplights. After the second stoplight, take the next left onto Laurel Street (You will see the office on the corner). After 50 yards on Laurel Street, turn right and then another immediate right into the parking lot. Follow the road to the front of the building for parking. Take Route 3 to Route 29 South. Follow Route 29 South to the Business 29 exit (2 exits south). Take the Business 29 exit and at the end of the ramp turn right onto Business 29. Follow for ½ mile. As you crest a small hill you will see the office on the right at the corner. Turn right onto Laurel Street. (If you get to the stoplight at Sunset Lane, you have gone too far.) Proceed 50 yards on Laurel Street and take the first right followed by another immediate right into the parking lot. Follow the road to the front of the building for parking. Take Route 15 to Route 29 South. Follow Route 29 South for 1 exit and take the Business 29 exit. At the end of the ramp, turn right onto Business 29. Follow for ½ mile. As you crest a small hill you will see the office on the right at the corner. Turn right onto Laurel Street. (If you get to the stoplight at Sunset Lane, you have gone too far.) Proceed 50 yards on Laurel Street and take the first right followed by another immediate right into the parking lot. Follow the road to the front of the building for parking.